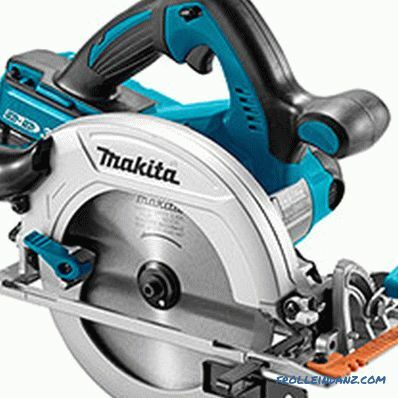 Circular saw is a rather complicated and traumatic tool, respectively, many models are designed to perform certain types of work with a certain intensity. 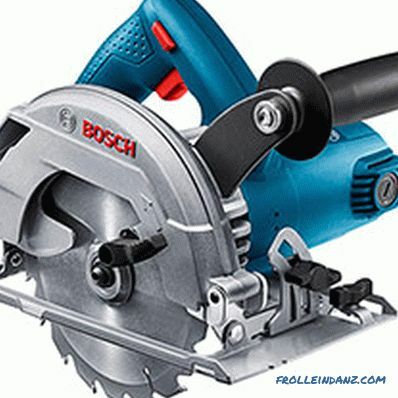 Only by accurately assuming, at a minimum, the scope of use of the tool, can one decide how to choose a circular saw — which characteristics to pay particular attention to and which ones to neglect. At first glance, the device of the circular saw is as simple as possible - a powerful engine with a detachable metal disc on the shaft. In the case of stationary tools, the engine can be located separately and transmit the force to the working shaft with a belt through a system of pulleys, but the hand tools, of which the majority of household appliances, are made in the same housing. Difficulties to the device are added by the need to use quality materials, strict adherence to the alignment of parts, plus the maintenance of serious security measures. 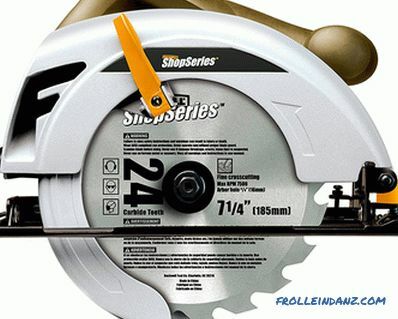 The saw blade rotates at high speeds, so disregard of any of the listed items will, at best, damage the tool. As a result, an impressive amount of mechanical-electronic protective and blocking devices are added to the engine and the cutting wheel, the purpose of which is to instantly stop and de-energize the tool if something went wrong. 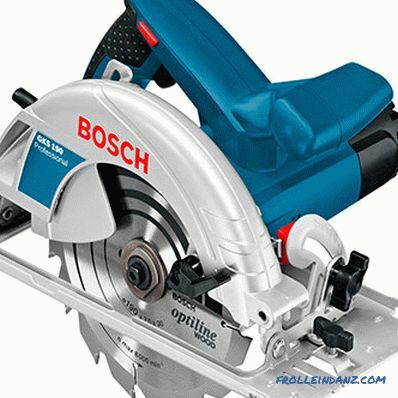 The principle of operation of a circular saw is clear from its design - a rotating disk with teeth saws a board along which the tool itself is pulled. In the case of a stationary saw, everything happens the other way around - the board is pulled through a circle fixed on the frame and divided into two parts. 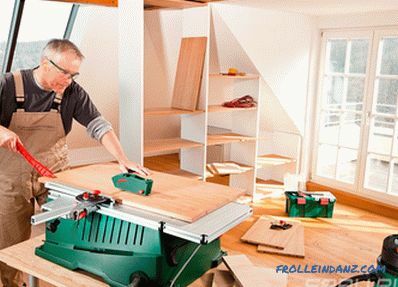 There is one important note to the use of the circular saw - it is not suitable for shape cutting and is intended to cut boards and other materials only in a straight line. There are models with an additional graduation of the leading sole, which makes it possible to expose the disc not strictly perpendicular to the sawn surface, but at a certain angle, but at the same time the saw is also carried out strictly in a straight line. 1. Upper main protective cover. 8. Adjust the angle of cut. 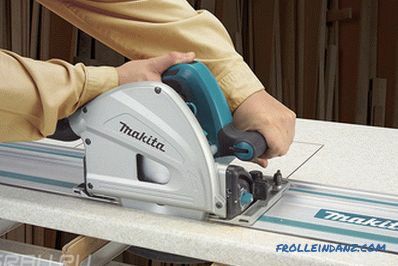 To select the type of circular saw that is suitable for the planned work, one must imagine their existing varieties. 1. Stationary. Such a saw is suitable for performing a large amount of repetitive work, for example, in production where a large amount of sawn timber is constantly processed. Such a tool is installed on a separate frame, is appropriately sized and requires a separate place for installation, and in some cases even a room. 2. Tabletop. Reduced version of the stationary circular saw - also mounted on a stationary base but much smaller. Suitable for large volumes of domestic work - for example, when building a house, bath or similar structure. 3. Manual. Mobile device that can be used to work a part in several planes. Used to work with different materials: wood, plastic, soft metals, etc. Of all the species, it has the smallest capacity and requires periodic rest, but is mainly used for those types of work where it is not critical. 1. Professional. The materials and design solutions used in such devices allow their use without interruption throughout the working day. Usually these are universal tools that are suitable for processing materials of various stiffness and sizes. 2. Household. Modern household circular saws, as well as professional models, can boast of versatility in their work, but they necessarily require compliance with the load conditions. This is usually about 15 minutes of work for the same amount of rest time. 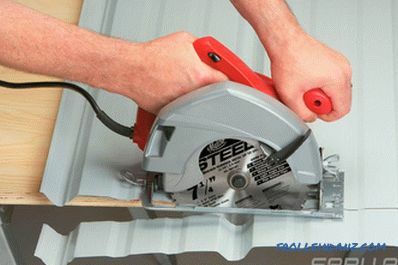 Using a conventional circular saw, various wooden elements can be cut into pieces. 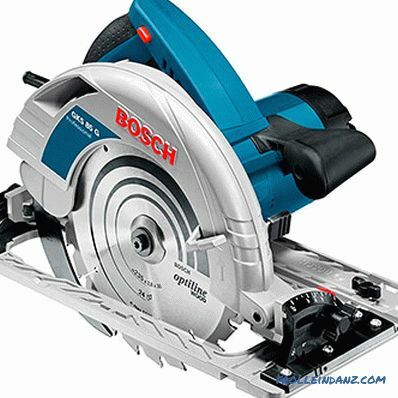 A conventional circular saw can cut various wooden elements into pieces at various angles. 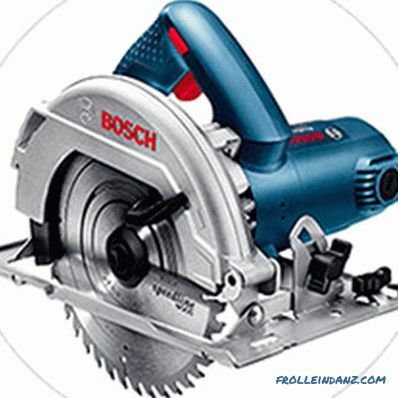 However, there are special purpose circular saws. Some of them are capable of sinking into wood, others are adapted for working with metal. 1. 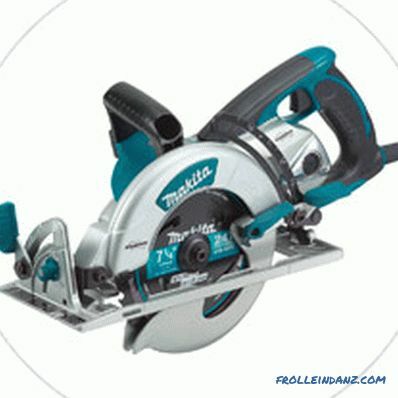 Circular saw for metal. A saw involving work with metals should be more powerful and adapted to work with different cutting discs - standard abrasive and increased strength. In fact, it is the most versatile tool that allows to cut up any materials: sheets, pipes and profiles made of metal, wooden blanks, plywood, plastic and the like. 2. Immersion Circular Saw. 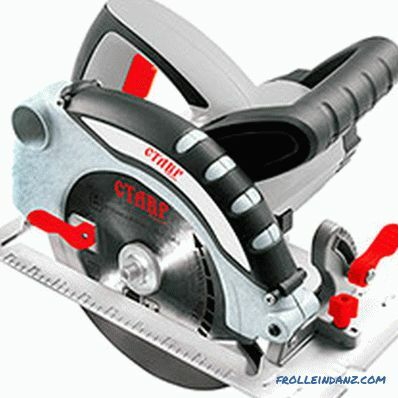 This class includes circular saws of the manual type and stationary, with a movable saw blade. The cutting edge of such tools can be lowered into the center of the part and start cutting from this point, which allows cutting through holes in the blanks. Such devices are most often used to work with plywood, OSB and similar sheet materials. The visually noticeable feature of submersible circular baffles is the absence of a lower automatic protective casing and a special construction of the base plate, which makes it possible to adjust the depth of cut to the nearest millimeter. This allows not only to make through-cuts, but also to make straight and figured (if the saw design allows you to make cuts at an angle) grooves, grooves and slots. 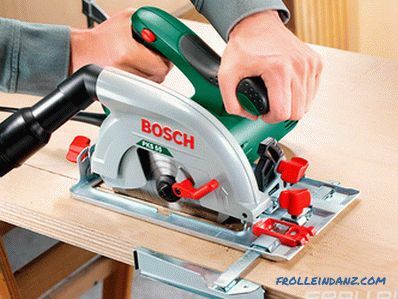 Before choosing a circular saw on a tree for a house, it is necessary to consider such devices, since they have maximum versatility. 1 . Network. 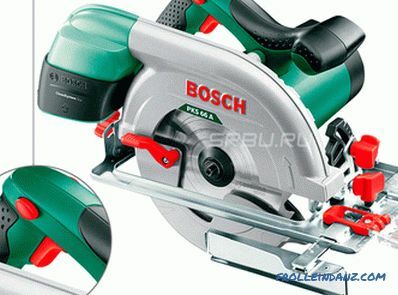 The bulk of circular saws are made with 220 mains power supply (household manual) or 380 volt (stationary professional). They can be identified only two drawbacks: the need for an electrical network and the ability to get lost in the wire. 2. Battery. For such a saw, you also need a socket, but only to charge the battery. Then it works completely offline, but only for 30-50 minutes, depending on the battery capacity. The main disadvantage of such devices in battery charging time, which is 5-8 times longer than the battery life. 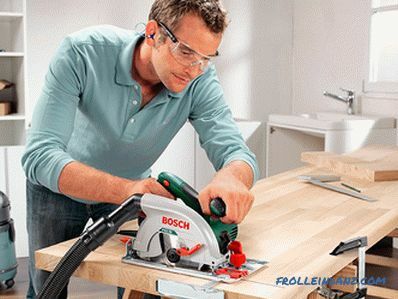 As a result, given the high cost, it makes sense to acquire cordless tools only with frequent short work in hard-to-reach places, it is much easier to take a wireless saw than to drive a temporary power cable. For example, it can be roofing or similar work at high altitude, where you have to constantly move along with the tool. When you decide on the type of circulating saw, you can go directly to the choice of its performance, which determines the performance and usability. 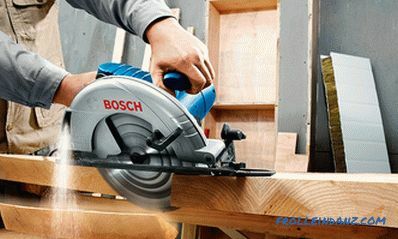 Traditionally, the power of a circular saw motor is tied to the diameter of the saw blade - the larger the disc, the more watts the circular motor should have. But then healthy competition comes into play - in the struggle of manufacturers for their customers, they can equip roughly the same model characteristics with engines of different power. Here we must understand the direct relationship - the more powerful the engine, the more force is transferred to the place of mounting the disk to the shaft. This means that a more powerful electric motor allows the saw to work more stably, it is better to withstand the frequency of disk speed, process denser materials and generally work longer without rest. The only disadvantage is the probability of getting a tool with a disk mount, which was originally designed for less weak models. When buying, you need to pay attention to fasteners - ideally, for a more powerful engine, they should be at least massive, although much depends on the quality of materials. It should also be borne in mind that excessive power is additional spending on the purchase and maintenance. - manual, for sawing small blanks. - most home appliances that handle almost with all the housework. Which of these tools to choose depends solely on the planned scope of work. The smaller the probability that the disc is jammed in the workpiece. Dense materials are easier to process. Here there are enough of its own nuances - for example, the cleanliness of the cut also strongly depends on the shape and number of teeth on the disk, but basically this dependence. Additionally, it must be borne in mind that high rotation speed is an increased temperature at the point of cutting, which means materials like plastic or laminate may turn out to be with melted edges. 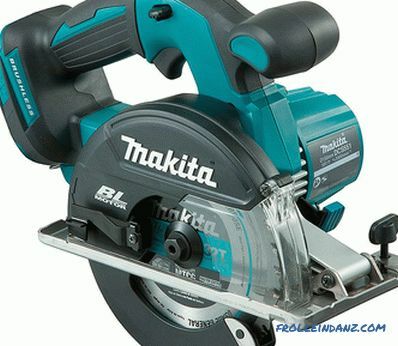 If you plan to work with such materials, then the best way is to find a circular saw with an adjustable number of revolutions of the disk rotation. Sometimes this characteristic is confused with the diameter of the mounting hole, but the latter is usually not so important and shows only whether a certain disk fits the saw seat. The full disc diameter is fundamental for the circular saw as a whole, because all other characteristics are selected for it. Dependence here is very simple - the larger the diameter of the saw blade, the more powerful and with greater torque the engine should be - this affects the launch speed, smooth operation and reduced likelihood of jamming. The more powerful the engine, the more difficult the protective and stabilizing work of the saw should be - the filling - in turn, all this leads to an increase in weight, size and cost of the circular as a whole. 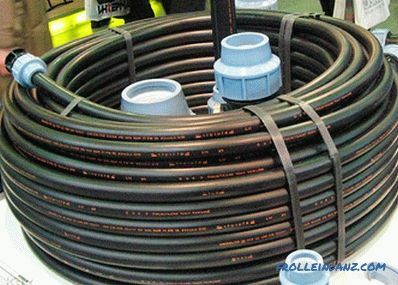 All these difficulties are necessary and important, since the larger the disc diameter, the thicker the part it can cut in one pass. 4-5 cm — the initial, least powerful class of tools. 5-6.5 cm - representatives of the universal "golden mean". 6.5-14 cm are heavy, professional devices. The cutting depth is not always determined solely by the difference between the outside radius of the saw blade and the bore. To a greater extent, one should look at how much a disc stands for the plane of the base plate, since this part additionally "eats" 1-1.5 cm, and normal work without it is simply impossible. You must also take into account the ability of the circular saw to make cuts at an angle, which again is determined by the design of the support plate. 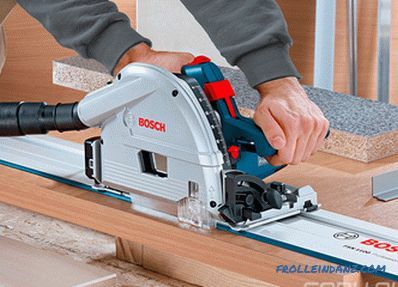 If the circular saw allows you to cut at a variable angle, then the manufacturer usually indicates the cutting depth for 90 ° and 45 ° in the specifications. 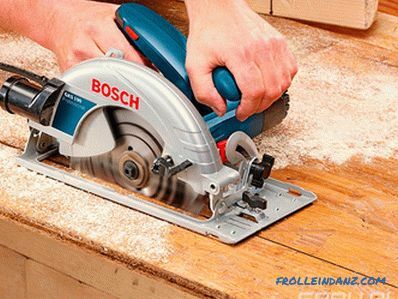 When selecting a circular saw with the ability to adjust the cutting angle, special attention should be paid to the quality of the reference plate and located on it fasteners and graduations. The main signs of quality are the ease of changing the position, the ease and reliability of fixing the clamps, as well as the absence of backlash. Not all manufacturers can get rid of them completely, but if the backing plate of the new tool has a “backlash” after fixing all the small arms, then you should think about finding an alternative. The base plate material is often cast light alloys, but not uncommon and extruded steel platforms. The former are lighter and well-shaped, while the latter are more resistant to shocks. The presence of a large number of auxiliary and protective systems is due to the high injury risk of the circular. They protect the tool from breakage and the owner from injury, so it will be useful to find out which types of protection are installed on the saw by the manufacturer. The unit for maintaining a given speed of rotation of the disk under load is also called constant electronics. It is based on the controller, which receives data on the frequency of rotation of the motor shaft. When the operator starts to drive the saw faster or it just hits the knot or the denser part of the workpiece, the engine speed is reduced and the controller sends a signal to the electronics about the need to increase power, which occurs without operator participation. The same, but exactly the opposite, occurs in the opposite case - when the nominal speed is exceeded, the engine power decreases. 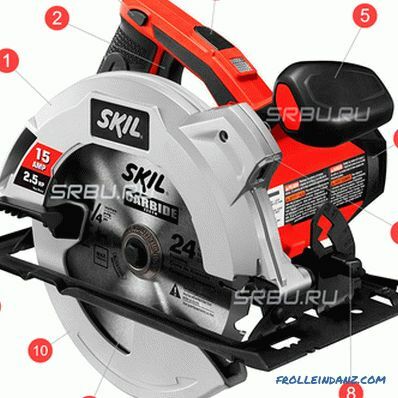 In order for this function to work properly, the motor of a circular saw must have a certain power reserve, which is not always realizable on devices of the weak and even middle class.If the budget saw indicates the presence of this option, then you should pay attention to the ratio of the disk diameter and engine power. If the simplest stabilizing device can equalize the speed of rotation of the disk to only one given standard frequency, the presence of a stabilizing mechanism on the engine with a gradually changing number of revolutions is considered to be the highest class. The service life of the motor increases, since Starting in the winding does not produce excessively large starting currents. If, for any reason, the saw is already launched in a partially cut groove, the possibility of cutting the saw teeth into the material and the consequent sharp jerks of the tool are excluded. When used in the construction of a gearbox, the soft-start system significantly brightens up his life, which otherwise would surely spoil the sudden jerks at the start. Practice shows that most often the overheating of the motor of the power tool is allowed not by beginners, but by masters with extensive experience who, due to haste or for some reason reasons cease to "listen" to the state of the engine. 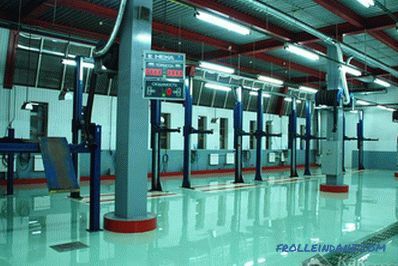 In this case, the safety of the windings and their protection from overheating is assumed by the motor overload protection system, which monitors the energy consumption level and turns off the power during a sudden load on the network. The weight of the steel cutting disc creates a sufficiently high rotational inertia, which is fully manifested after turning off the power at idle. When the release key is released, the disk can spin for a minute or two with enough force to cause injury. To eliminate this possibility, an electrodynamic brake system is used - after releasing the start key, the motor rotor is braked by counteracting the movement of the stator field, while doing so only a few turns. Such a system protects the operator from injury, the workpiece is protected from accidental damage, and the circular itself from a back stroke if the disc teeth catch on a hard surface. When the saw blade stops abruptly, none of existing braking systems are not able to instantly stop the engine so that its inertia does not create a kickback, pulling the saw from the hands of the operator. A slip clutch is used to protect against this kind of accident, and instead of trying to stop the engine, it simply breaks the contact between it and the saw blade. The latter remains in the material, and the engine continues to rotate by itself. However, the operator will immediately turn it off, because when the slip clutch is triggered, a short-term “screaming” of the motor will occur due to a sharp increase in revolutions from a decrease in load. Unintentionally turning on the circular saw is so fraught with the creation of a traumatic situation that the designers tried to eliminate this possibility altogether. To do this, the saw starts only after pressing two separate buttons, one of which is often recessed into the plastic of the case. On many tools, manufacturers install a separate button that allows you to lock the tool in the on state. It is useless to look for such a lock on the circular saw - safety is paramount. To make it easier to change the work discs, the blade motor shaft can be fixed with a separate button or lever — sometimes it uses fast disc braking mechanisms and fixation can occur in any position. Maybe the other way around - in some cases, manufacturers consider the spindle stop an unnecessary function and then the disk has to be changed with two keys. A nut tightening a disk does not have to be tightened with a key. In some cases, it is tightened with a screwdriver or even becomes quick-clamping at all - for manual tightening. 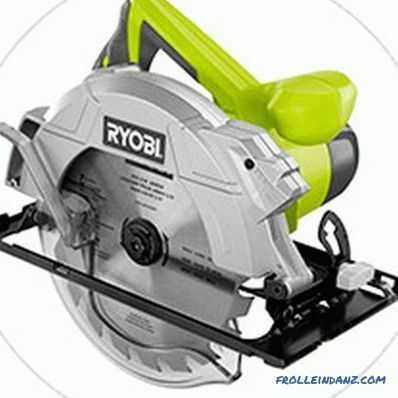 When deciding on which hand-held circular saw to choose, the last question is the accuracy of its operation, for which parallel stops and guide rails are used. The first of them is, in fact, an ordinary stand or ruler, on which the sole of the saw rests, when carried along the workpiece. In general, a good method, but it requires a certain skill to control a circulator - you have to lead the saw and at the same time press it to the parallel stop. The guide tire is a great cutting accuracy, since the tool does not have the ability to "swing" to the side during operation.For this purpose, a special groove is provided in the sole of the saw, with which it “fits” onto the previously set guide rail. 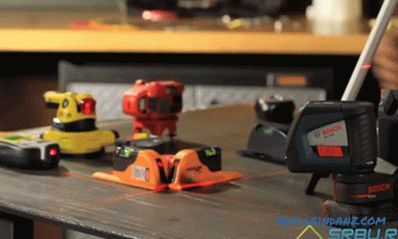 If it is necessary to withstand the cutting direction manually, various aiming devices are used - from the slotted opening on the base plate to the laser line builder, which will show where the saw goes. For maximum user protection, the saw disk is hidden from it by the covers - the main top and spring-loaded bottom. It looks like the whole disk is hidden under the covers and rotates under them when turned on. When the sawing of the workpiece begins, the spring-loaded casing engages its edge and is led away under the main one. When the saw is removed from the workpiece, the spring-loaded cover immediately returns to its place, protecting the user from possible contact with the rotating disk. Also, this design does not allow to triumph trivially or otherwise cling to the teeth of the saw, even when it is stopped and de-energized. 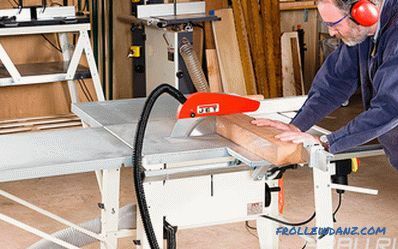 For everyday use, the hand-held circular saw is most often used, which means that the question of ergonomics should be given special attention. In this case, to give any unambiguous recommendations will not work, since the concept of convenience is different for everyone. About 10% of people on Earth are left-handed, and manufacturers always take this into account when making mirror models of tools. If the rear handle is more or less standard, there are at least three variations of the front handle: straight, mushroom and close. The first one is more suitable when working with a saw “from oneself”, the second one is more convenient to lead the saw from the side, and the third one is universal, but the size is more mushroom-shaped. Do not slip in your hands, help you better control the workflow. Depends on the design features of each tool, so before buying it is better to evaluate it with your own eyes. 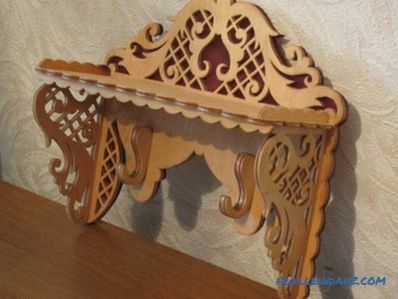 Performed by blowing out sawdust from the working area or connecting an industrial vacuum cleaner to the saw. To prevent the wire from twisting at least near the saw itself, the cable is pulled out of its body through a long and rigid input sleeve. Not so often required, but in any case it is better if there is a special window for this operation. In addition, the brushes can be self-disconnecting - when grinding a graphite rod, the chain is broken, and there may also be an indication of the status of the brushes. To evaluate it, you must take it in turn and simply hold several different circular patterns in your hands. This will immediately show what to look for. The store will most likely not have a board or similar workpiece to check the work of the saw under load. Yes, and sellers are not particularly welcome such experiments, although just include a saw in the network should. This will allow to check at least the stability of the work, the noise level and the absence of vibrations at idle. 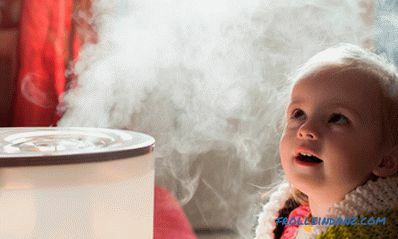 It is also possible to evaluate by the air flow how well the engine cooling works. 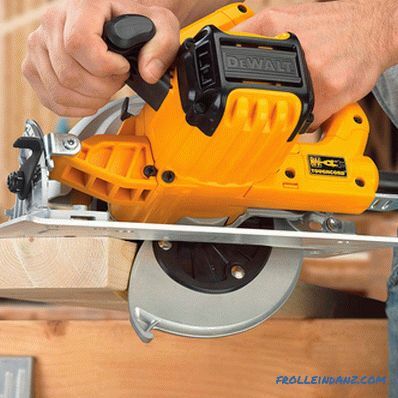 These are all the main points to consider before choosing a circular saw to give or at home. The main thing is to remember that the wrong choice of power tools is, at best, overpayment for unclaimed functions and increased power consumption, and at worst, its uncertain work and the possibility of failure at the most inopportune moment. We hope that this review will help you choose the right model.